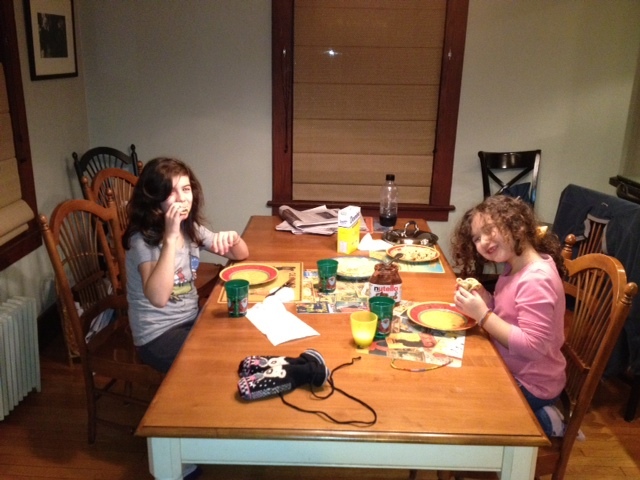 … Sophie and Chloe convince the Papa to make crepes. They certainly seem to have had fun. When I arrived home, Chloe was jabbering away. Non-stop. Sophie started jabbering at the same time. I started to get a headache. My friend and I had a great time in the city. She found her wedding dress, we went to the Met and saw a fantastic exhibit, “The Renaissance Portrait,” went to the movies, discovered Eataly and relaxed. We weren’t tied to a schedule, or our kids and we had fun! We celebrated Chloe’s pre-birthday tonight. She turns 11 tomorrow. She picked out the cell phone she wants to receive the day she graduates from 5th grade. Chloe’s trying to convince her Grammy to quit Sprint for Verizon so that she can join the family plan we will have when Chloe receives her cell phone the day after graduation. Seriously – she’s done all the research. Too bad the phone she chose will probably no longer exist in five months, but no matter. She’s cell phone ready.